As summer settles in, construction of all kinds continues throughout London. It seems no area of the city is without the presence of cranes, lorries and workers. One of the biggest areas of development continues to be in the Battersea Power Station and Nine Elms corridor. The almost 40 acre Battersea site was purchased in September 2012 by Malaysian firms Sime Darby and Sp Setia for £400 million but yet little can be seen of any construction of the 866 luxury apartments with most already being sold. The London Borough of Wandsworth granted detailed planning permission for Phase One of the Battersea Power Station development on 13 December 2012. Pricing of the first phase flats ranged from £350,000 for a studio to £6million for a penthouse suite. Sales were impressive with most of the buyers being outside Britain. 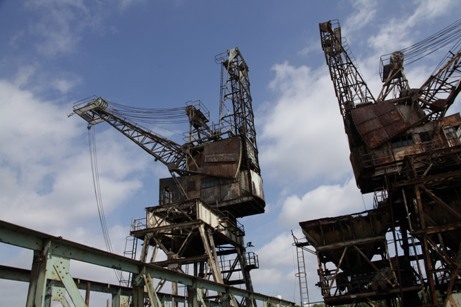 Bloomberg news reported recently that the consortium led by SP Setia and Sime Darby were planning to acquire £2 billion from British and international banks to renovate the site which has become derelict after decades of neglect. Both companies hold a 40 percent stake with the rest being held by Employees Provident Pension Fund in Malaysia. The consortiums plans are valued at £8 billion which include not only apartments but offices, restaurants and shops. Phase Two of Battersea went on sale in May 2014 with property experts predicting the penthouses could fetch up to £30 million each. The new homes range in size from studio apartments to sprawling five-bedroom 'villas' positioned beneath the four chimneys. The 254 properties will be located within the existing facades of the western and eastern flanks of the former Power Station and on top of the central boiler house. In the first week reservations for 95 percent of the available properties had been made. A press release from the 8th April 2014 regarding the development of another area of the Battersea property stated, "Phase Three, a key part of the regeneration of the Battersea site, has been designed by Gehry Partners and Foster + Partners and includes new homes and a new high street, known as The Electric Boulevard, in an area to the south of the landmark Battersea Power Station. The Electric Boulevard will be the main gateway to the 42-acre development, connecting the Northern Line extension station with the power station. The phase includes more than 1,300 homes in a range of sizes and styles in two zones on either side of the boulevard, as well as a 160-room hotel, retail spaces, restaurants and leisure facilities." Also released in June of this year were the reports submitted for approval of the plans by London Transport for the Battersea area. The release stated, "The Northern Line extension from Kennington will provide the fast, high capacity transport link needed to support a major increase in the number of residents and businesses based in Nine Elms on the South Bank. 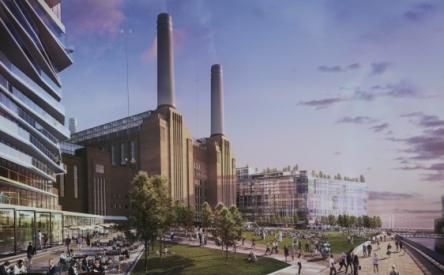 It would provide two new tube stops within the area – one would be located on Wandsworth Road and another at Battersea Power Station." A £1 billion government loan guarantee toward construction has been provided to insure the construction of the two new stations with a completion date by 2019. One issue that remains is with the four iconic chimneys. The plans are to have them removed and replaced by new identical copies. Justin Philips, project principal and partner of engineering consultants Buro Happold, told the Independent the project to rebuild the chimneys and paint them in their original colour will be completed by 2016. 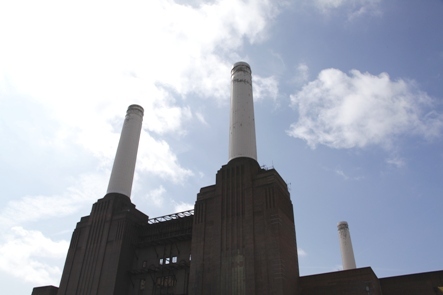 The Battersea Power Development Company said: "After half a century in service, the years have taken their toll on the chimneys particularly. The combination of sulphurous emissions and exposure to the weather has meant the steel reinforcements in the chimneys are corroding and the concrete cracking and disintegrating." But Brian Barnes MBE and Keith Garner of the Battersea Power Station Community Group (BPSCG) are sceptical of not only the issues of the chimneys but of the financial viability of the entire development. They have been working for years to keep the building listed and protected by English Heritage to stop massive development that they see as detrimental to the integrity and survival of the property. They have also been outspoken critics of the various schemes put forward by owners of the power station both current and past. 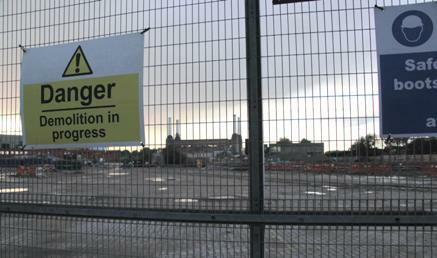 I made a visit recently to see what has occurred with the Battersea development site. The property is active with earth movers and cranes but I could not see (from several vantage points) any construction. The Nine Elms area is not only active but the construction of new projects has progressed quite a bit more including apartment buildings and the new American Embassy which is slated to be completed and in use by 2017. I went to adjacent buildings and took the lifts to the upper floors providing sweeping views of the Battersea property. There is some activity but not like what would be found at other large scale developments. Whilst the plans and sales for the Battersea regeneration have been impressive and robust, there are still concerns by the BPSCG as to whether or not the regeneration will be eventually completed mainly due to financial concerns. 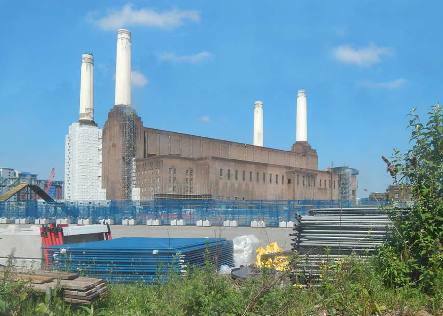 See last years coverage on my visit to Battersea here and see the progress.